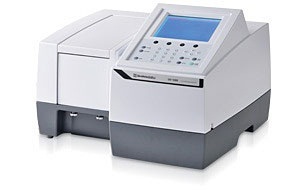 Designed by the leaders in UV-Visible Spectroscopy for molecular absorption quantitative analysis, the UV-1280 Multipurpose UV-Visible Spectrophotometer offers wavelength scanning from 190-1100nm. This lower-cost, high-quality instrument is ideal for applications ranging from routine environmental and food quality testing to life science analyses. The easy-to-see LCD and buttons enable userfriendly, intuitive measurement, instrument validation, and printing operations. Instrument validation functions have been enhanced. 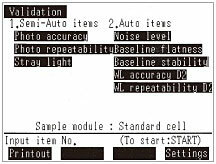 The checks for JIS items can be performed automatically or semiautomatically. Linking with a 6-series multi-cell (optional) is possible, making sample replacement unnecessary. Inspections can be performed efficiently. Equipped with a range of programs, the UV-1280 can be used for everything from photometric, spectral, and kinetics measurements to DNA/protein and high-level multi-component quantitation. Measures the absorbance or transmittance at a single wavelength or multiple (up to eight) wavelengths. 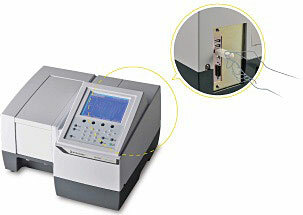 The instrument is also capable of simple quantitation using the K-factor method. For a multiple-wavelength measurement, calculations can be performed on the data obtained for up to four wavelengths, including the calculation of the difference between, or ratio of, the measurements obtained for two wavelengths. A sample spectrum is recorded using wavelength scanning. Repeat scans let you follow sample changes over time. Zoom in on the finished spectrum for a better view; subsequently, use the peak/valley pick function to select maxima and minima and perform a wide variety of data processing functions. Generates a calibration curve from the measurement of standards, and then calculates the concentrations of unknowns. Allows various combinations of wavelength number (1 to 3 wavelengths and derivatives) and calibration curves (K-factor and first-to-third order). Measures absorbance changes as a function of time, and obtains the enzymatic activity values. The kinetics measurement method automatically calculates the amount of change per minute, and then calculates an activity value from a specified coefficient. The rate measurement method, which determines whether the absorbance is changing linearly, can also be selected. In addition, add the CPS-100 thermoelectrically temperature-controlled cell positioner for measurement of multiple samples in succession. Measures the change in absorbance, transmittance or energy as a function of time. Add the CPS-100 thermoelectrically temperature-controlled cell positioner for simultaneous measurement of multiple samples under constant-temperature conditions. Quantitates up to eight components mixed in a single sample. The calibration equation is determined using pure or mixed components with known values. Determine DNA and protein concentrations with the following quantitation methods using the bioscience/life science program included as standard. Quantitates DNA or protein using the absorbance at 260/230 nm or 260/280 nm. Using USB flash drives makes it easy to transport analysis data and to store large amounts of data in a PC. USB flash drives can be connected directly to the UV- 1280. Data for spectra and time-course curves can be displayed and saved with commercial spreadsheet software.